Falls County (H-18) is located in Central Texas and is surrounded by Limestone, Robertson, Milam, Bell, and McLennan counties. 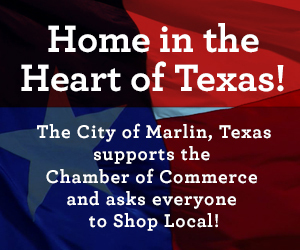 Marlin, the largest town and county seat, is 24 miles south of Waco and 121 miles south of Dallas. The county’s center lies at 31°15′ north latitude and 96°54′ west longitude. Falls County covers 765 square miles in the Blackland Prairie region. The gently rolling terrain consists of broad flatlands, with elevations ranging from 300 to 500 feet, and the Brazos River bisects the county. Over 70 percent of the county contains upland clayey and loamy soil used primarily for pasture and cultivated crops. The rest of the area has deep loamy or sandy and loamy soil which is used for specialized crops such as tomatoes and watermelons. The main natural resource is the land, but there are a few oil and gas wells. Mineral artesian wells in Marlin have made it a health center. Temperatures range from an average high of 93° F in July to an average low of 39° in January. The average yearly rainfall is slightly less than thirty-four inches and the growing season lasts 257 days. The falls of the Brazos River have long been an important fording and camping area for Indians and white settlers. The first Americans in the area were sent in 1819 by Dr. James Long to establish a trading house. Because of problems with the Mexican government they did not stay long. In 1825 the area was included in the impresario grant to Robert Leftwich of the Texas Association, a group from Nashville, Tennessee, which sought permission from the Mexican government to settle in Texas. Colonization did not take place at that time, however. Until 1829 the falls area did not have a permanent Indian settlement but served as hunting grounds for several tribes, including Wacos, Tawakonis, and Anadarkos, who were often attacked from the north by the stronger Comanches. The Cherokees arrived in the early 1830s, after the other Indians had been weakened by internal wars in 1829-30. The Cherokees were alone in the area until 1834-35, when Sterling C. Robertson began bringing American settlers to his Nashville colony (later called Robertson’s colony ). Although it was illegal under new laws passed by the Mexican government, nine families had settled in the area by 1830. In 1833 Robertson established the capital of his Nashville colony and called it Sarahville de Viesca. At this time problems with the Indians were exacerbated by clashes with the Mexicans, and in 1835 the settlers prepared for war with Mexico. The change of name from Fort Viesca to Fort Milam reflected the shift away from Mexico. In early 1836 all the settlers fled during the Runaway Scrape, giving Viesca the name of “the town that died overnight.” After the battle of San Jacinto families returned to the area, but Fort Milam never reached its former importance except as the head of the Brazos military operations against the Indians. By 1837-38 the Marlin family returned to Bucksnort, near Fort Milam, along with the Morgan family. By this time Indians had become a constant threat. In June 1837 several men were attacked and one killed. On January 1, 1839, the women and children at Morgan Point, the home of the Morgans, were killed in what came to be called Morgan’s Massacre. On January 10 the same group of Indians attacked Fort Marlin and were repulsed. Six days later the men from Bucksnort attacked the Indians; each side lost ten men, but the Indians won the encounter. Later that year the Texas legislature authorized men to patrol the region, and conflicts with Indians soon ceased. Peace was officially declared in 1845. On January 28, 1850, the state legislature formed Falls County from Limestone and Milam counties. The falls of the Brazos gave the county its name. Since Falls County was established its boundaries have not changed. The legislature stipulated that Viesca would be the county seat, but the citizens petitioned for another location because most of the residents lived east of the Brazos River. The citizens voted 20-0 in favor of Adams, which officially became the county seat on January 30, 1851. Soon after, the town was renamed Marlin in honor of the Marlin family. The settlers of Falls County came from the slaveholding South, primarily Mississippi, Tennessee, and Alabama. By the census of 1860 the county had 1,716 slaves (47 percent of the total population) and 504 farms. Falls County relied less on cotton than other Texas counties, harvesting only 2,030 bales in 1860, and relied instead on a diverse agricultural economy. Wool was a major crop, with 17,500 pounds produced in 1860, the highest in Falls County history. Cattle was the most important livestock, with 26,310, a total not matched until 1900. Falls County approved secession almost unanimously in 1861. The only dissenters were two prominent slaveholders. Almost 600 men, twice the voting population, fought for the Confederacy, and many lost their lives. Because of the distance from the occupied areas of the Confederacy, many refugees fled to Falls County. Some paused only briefly on their way to Mexico. Between 1860 and 1870 the white population grew from 3,614 to 16,240 while the black population went from 1,716 to 4,681. At the same time the number of farms went down 35 percent. Reconstruction was not as painful in Falls County as in other areas. The only person who could be considered a carpetbagger was District Judge J. W. Oliver, who was appointed by Governor Edmund J. Davis. During his tenure he called in black troops, which caused unrest in the county. George Elam, a Republican, was elected county judge in 1871 and 1873, perhaps with the help of the enfranchised freedmen. He could not be considered an outsider, however, since he fought in the Confederate army from Falls County. At the beginning of his term county taxes rose drastically. In 1876 Falls County was totally “redeemed” from Republican rule with the election of E. C. Stewart, a former slaveholder, who had owned thirty-nine slaves valued at $31,200 in 1864. After Reconstruction the county voted Democratic longer than most Texas counties. In 1872 the Republicans carried Falls County by only twenty-four votes, 50.7 percent of the total, due to the enfranchisement of blacks. After that, the county did not vote Republican in a presidential election for a century. The Democrats won 82 percent of the vote in the 1876 election. Falls County returned Democratic majorities in every election until Richard Nixon’s victory over liberal Democrat George McGovern in 1972. The county then returned to its Democratic practices, voting overwhelmingly for Jimmy Carter in 1976 and 1980. County voters helped Republican Ronald Reagan win Texas in 1984 but returned to the Democratic party in 1988 and 1992. Transportation in Falls County relied on stagecoach lines and private transportation until the Reconstruction era. Until the middle 1880s cattle were driven up to the Waco area to connect with the Chisholm Trail. The Houston and Texas Central Railroad became the first railroad through the county around 1870. It passed through Marlin and led to the establishment of the towns of Reagan and Perry. Two other railroads eventually passed through the county. When the San Antonio and Aransas Pass Railway came through in 1890-92 it led to the founding of Rosebud, Travis, Lott, Chilton, and Satin, which in turn resulted in a shift of the county’s population from east to west. In 1902 the Missouri Pacific passed through Marlin, and the towns of Eloise, Highbank, McClanahan, and Otto soon grew up along the line. The first automobile appeared in the county in 1904. By 1927 the road which eventually became U.S. Highway 77 became a state highway. In 1930 the other major road in the county became State Highway 7. In 1915 an airport shed was built to house three airplanes. Promoters put on an airshow near Marlin, but it was closed one year later when a female pilot was killed in a crash. Marlin was the largest town, with a population of 4,000, just over 10 percent of the county’s total population. Most residents lived in rural areas or small towns. From 1880 to 1920 the number of manufacturing establishments increased from twelve to thirty-four employing 100 people. By 1930 the number dropped to eight establishments employing 118 people. Hot mineral springs were discovered in 1891 in Marlin, which became a major health resort in the early twentieth century. The years of the Great Depression and World War IIq brought about significant changes in Falls County. The population dropped by 8 percent, the first decline since the formation of the county. The ratio of blacks to whites remained the same. The depression caused a 64 percent drop in the number of farms, and the value of the farms dropped 55 percent. Cotton dropped 57 percent, and corn dropped to less than 1 percent of its earlier high. Hog raising remained steady, while cattle and sheep raising increased 25 and 61 percent, respectively. Falls County continued to feel the effects of the depression and had a slow recovery from 1950 to 1982. The population decreased steadily until 1970, when it levelled off at 17,000. The county gained 646 people between 1970 and 1980, and the percentage of blacks dropped from the 32 percent level it had maintained for sixty years to 27 percent. In 1990 there were 17,712 county residents. The number of cattle reached its highest point of 106,807 in 1982, while the numbers of hogs and sheep dropped to an insignificant number. The decrease in farms continued until there were only 1,117 in 1982. Cotton became insignificant and corn returned almost to its predepression level, but wheat and grain sorghum became major crops, each with over a million bushels. Manufacturing establishments averaged around twelve during this period and employed the most people in 1967 before declining once again. Fertilizer, farming equipment, and supplies were the main manufactured goods. The mineral water in Marlin remained an important industry. Manufacturing went from 8 percent of employment in 1965 to 19 percent in 1986. Retail trade remained at around 35 percent and services around 29 percent during the same time period. Although the automobile became an important mode of transportation, State Highway 6 was the only major highway built after 1930. In 1982 the total public road mileage was 1,179 miles. In 1974 Falls County had 6,944 registered vehicles and by 1982 there were 17,422. 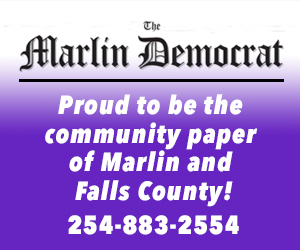 Marlin Oil Company installed the first electric generator in Marlin in the early 1890s, but it was only available to a few homes and businesses. Education improved drastically over three decades. In 1950 only 13 percent of those over twenty-five were high school graduates; by 1980 that number had risen to 42 percent. In 1982 an estimated 11,901 residents (65 percent) belonged to one of the fifty-three churches in the county, primarily Southern Baptist, Catholic, and Methodist. Marlin had two cab companies, an intercity bus service, and a municipal airport. The county had three newspapers, one radio station, two libraries, and nine parks containing 717 acres. Every spring Festival days are held in Marlin. BIBLIOGRAPHY: Walter W. Brawn, The History of Falls County (M.A. thesis, Baylor University, 1938). Old Settlers and Veterans Association of Falls County, History of Falls County, Texas (Marlin?, Texas, 1947). Falls County Historical Commission, Families of Falls County (Austin: Eakin Press, 1987). Lillian S. St. Romain, Western Falls County, Texas (Austin: Texas State Historical Association, 1951).